Moccasin Lake Environmental Education Center Visit this 51-acre preserve located within the city of Clearwater. Experience and enjoy the way native Florida used to be, as well as learn about environmental conservation. 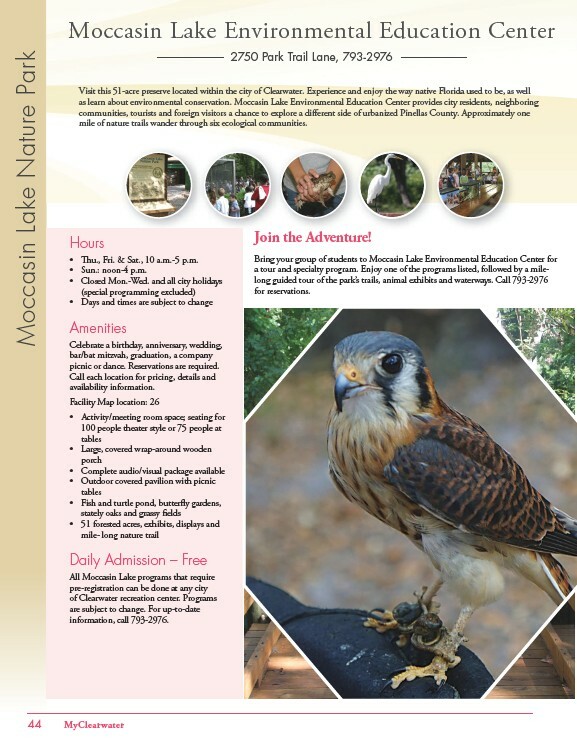 Moccasin Lake Environmental Education Center provides city residents, neighboring communities, tourists and foreign visitors a chance to explore a different side of urbanized Pinellas County. Approximately one mile of nature trails wander through six ecological communities. 44 MyClearwater 2750 Park Trail Lane, 793-2976 Hours • Thu., Fri. & Sat., 10 a.m.-5 p.m. • Sun. : noon-4 p.m. • Closed Mon.-Wed. and all city holidays (special programming excluded) • Days and times are subject to change Amenities Celebrate a birthday, anniversary, wedding, bar/bat mitzvah, graduation, a company picnic or dance. Reservations are required. Call each location for pricing, details and availability information. Facility Map location: 26 • Activity/meeting room space; seating for 100 people theater style or 75 people at tables • Large, covered wrap-around wooden porch • Complete audio/visual package available • Outdoor covered pavilion with picnic tables • Fish and turtle pond, butterfly gardens, stately oaks and grassy fields • 51 forested acres, exhibits, displays and mile- long nature trail Daily Admission – Free All Moccasin Lake programs that require pre-registration can be done at any city of Clearwater recreation center. Programs are subject to change. For up-to-date information, call 793-2976. Moccasin Lake Nature Park Join the Adventure! Bring your group of students to Moccasin Lake Environmental Education Center for a tour and specialty program. Enjoy one of the programs listed, followed by a milelong guided tour of the park’s trails, animal exhibits and waterways. Call 793-2976 for reservations.